Circular economy is a manifestation of economic models that highlight business opportunities where cycles rather than linear processes, dominate. It is restorative and regenerative by design and aims to keep products, components, and materials at their highest utility and value at all times. In today’s established economic systems, goods are produced, used and discarded, a linear economy where the flow has a clear beginning and a clear end. A circular economy works quite differently. Products and services in a circular economy are designed in a way that allows them to be reused, either in the biological or technical cycles. All products are manufactured in a way so they can be disassembled and materials will either be broken down by nature or returned to production. Biological material therefore consists of non-toxic, clean feeds and technical materials are designed to be a resource to be used industrially again. The goal is to throw nothing away and to reduce the need for purchasing new commodities, while production and transportation is best achieved with renewable energy. These basic principles provide a framework that weaves together methods and approaches drawn from different sources like cradle-to-cradle, biomimicry, industrial symbiosis, ecosystem services, collaborative consumption and, of course, both established and new methods of recovery and recycling of waste. The circular economy is a markedly different way to do business, forcing companies to rethink everything from how to design and manufacture products to their relationships with customers. One of the biggest differences is the customer’s role. The focus is no longer on consumption, but instead on the use of a function. This places different demands on the business community to build long-term relationships in their business models. The advantage is that companies benefit from each other’s success in this cascade of different cycles. The shift is a challenge, but it also brings new opportunities in infrastructure, energy and production in their adaption to fit the circular economy model. Some business models are easier than others to begin with, such as the leasing of products instead of buying (everything from jeans to trucks), companies which collect and renovate their own products and then sell them in the store in a separate department or peer-to-peer models. Companies will find new ways to extend the life of products or components, to find value in the waste, or the design of circular use. In the end it is all about encouraging the next generations to think and design in a sustainable way as well as using circular business systems to build a better future. 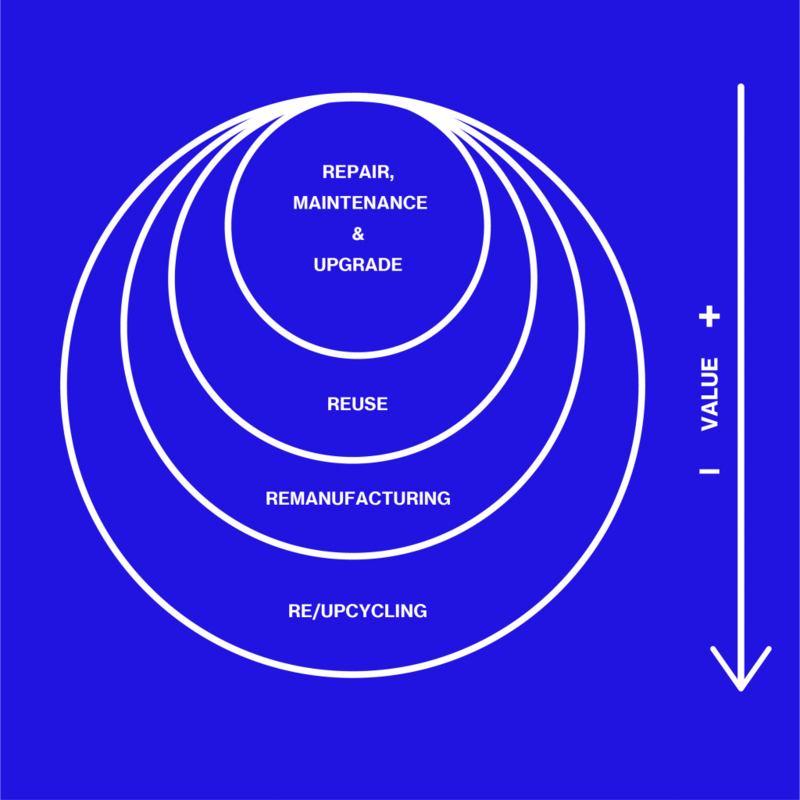 Circular economy is all about retaining value. The better the integrity of the product is preserved, the more value is retained. More information and Circular economy in practice cases?